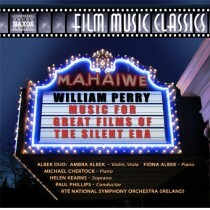 American composer and pianist William Perry is credited with playing a significant role in the revival of interest in films of the silent era. 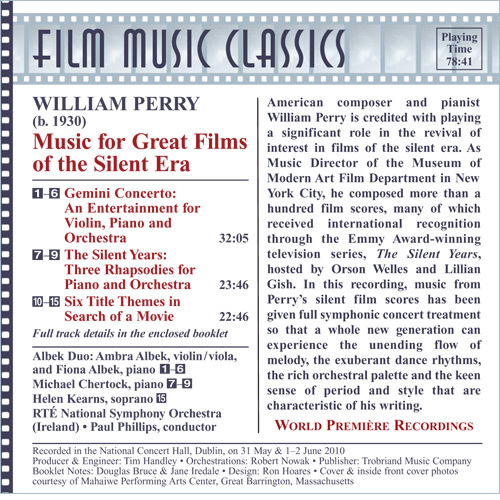 As Music Director of the Museum of Modern Art Film Department in New York City, he composed more than a hundred film scores, many of which received international recognition through the Emmy Award-winning television series, The Silent Years, hosted by Orson Welles and Lillian Gish. In this recording, music from Perry’s silent film scores has been given full symphonic concert treatment so that a whole new generation can experience the unending flow of melody, the exuberant dance rhythms, the rich orchestral palette and the keen sense of period and style that are characteristic of his writing.